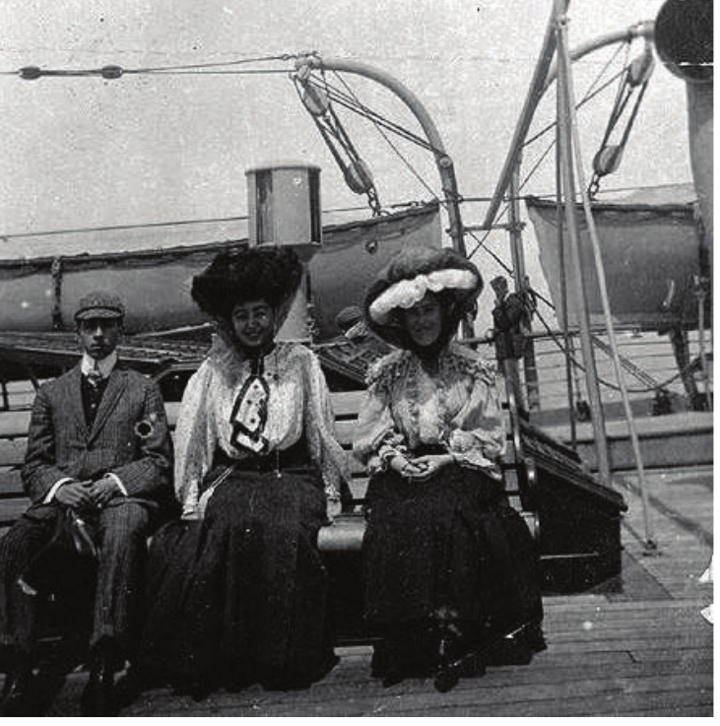 Young Jewish women on a ship's deck, Tangier, c. 1905. Beth Hatefutsoth Photo Archive, courtesy of Dona Buzaglo, Tangier. I have just read a fantastic book, Quand Israël rentre chez soi [When Israel comes home]. . . . Thanks to this book, I know where I should apply my efforts. . . . Above all I must learn Hebrew. . . . Maybe a Jewish nation will rise, a country. This account of the discovery of the Jewish nationalist awakening was written on August 4, 1943 in a personal diary by Alegría Bendelac, then a fifteenyear- old Jewish girl in the Moroccan city of Tangier, who had come across a few Zionist publications in her aunt's house. Alegría lived in Tangier until age thirty-five, when she immigrated to the United States, accompanied by her husband and young daughters. Her mother, however, joined her younger daughter in Israel, a few months before Alegría's immigration to the United States. 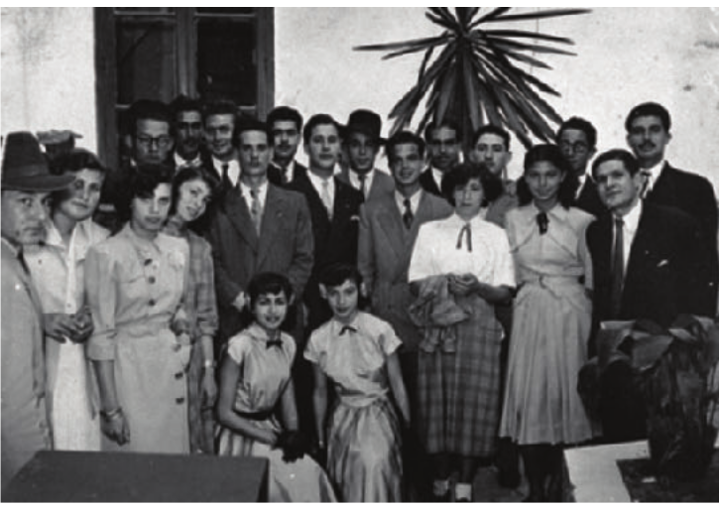 The years between Alegría's discovery of Zionism as a teenager in 1943 and her eventual emigration in 1963 witnessed dramatic political shifts that drove the mass emigration of Jews from Arab and Muslim countries. In Morocco, specifically, the main political events included the founding of the State of Israel in 1948 and Morocco's independence in 1956. This dramatic series of events was followed by Operation Yachin (November 1961 through December 1964), an Israeli-directed mission with the express goal of "evacuating" Moroccan Jews to Israel. Of the remaining Moroccan Jews, 55 percent moved to Israel as part of this effort. According to records from the Jewish Agency, remarkably, Operation Yachin brought only 17.9 percent of the Jewish population of Tangier to Israel, the lowest percentage of any major city in Morocco during this period. Many Jews from Tangier chose to immigrate to other destinations in Europe and the Americas at that time. Why would the vast majority (82.1 percent) of Jews from Tangier choose to remain in Morocco or immigrate elsewhere during the momentous Operation Yachin, at a moment when aliyah became accessible to them as it did to their fellow Jews elsewhere in Morocco? And why would the remaining 17.9 percent choose differently and immigrate to Israel at the earlier phase, occasionally even when family members remained in Tangier or migrated elsewhere? And what caused others to join the wave of aliyah at a later date, as Jewish Agency records further show? Members of Bachad (the Alliance of Religious Friends). Tangier, Morocco, 1950. Members of the group made aliyah to Israel in 1953. Beth Hatefutsoth, Photo Archive, courtesy of Simon Ben Ouliel, Holon. Related questions regarding migration preferences arise among scholars who focus on Jewish migration and on global migration more generally. What makes this evolution of aliyah from Tangier so fascinating and distinct? 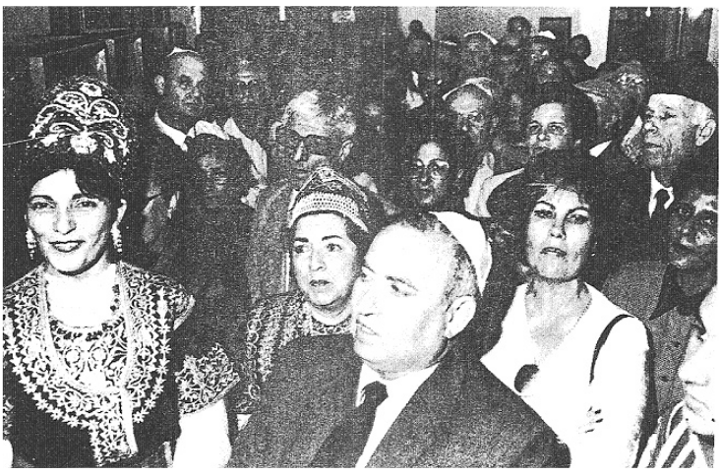 The process of aliyah from Arab and Muslim lands is still explained as a direct consequence of a volatile political situation in the Middle East and North Africa that caused Israel to "rescue" Jews from the hostile Middle Eastern environment, in some cases, fulfilling the collective and deeply rooted "traditional" Zionist ambitions of these populations for aliyah. Critical of this popular Zionist explanation for immigration, some scholars and Israeli social activists describe the majority of Mizrahi populations as a powerless "pawn" of Israel's Ashkenazi-led immigration project designed to populate the young state. In cases such as Tangier—as a range of scholars imply— this society represents the privileged, "Europeanized," economically better-off Mizrahi Jews who "escaped" Israel's maltreatment or who were indifferent to aliyah for more practical reasons. The commonly held explanations of Jewish immigration to Israel from Muslim lands have not kept pace with the vast literature on global migration that tends to place greater emphasis on individuals' dynamic identities and the synergic power of social networks that shape the decision to emigrate, against the backdrop of broader political or economic shifts. Immigrants from Tangier, members of MABAT (Hebrew acronym for Mifgash Bnei Tangir, the Reunion of Tangier's Natives) during an exposition in the Eretz Israel Museum, Tel Aviv, Israel, 1988. Reprinted from MABAT Revista 1, p. 92. The focus on aliyah from Tangier helps to provide a broader perspective on Jewish migration from Muslim lands, including Morocco, that goes beyond the discussion of Israel's immigration policy and the supposedly rigid collective identities of the migrants. Fundamental for understanding this migratory process is the fact that emigration did not only begin with the establishment of Israel. Jewish migration has been a constant part of the history of Tangier and other Moroccan cities, including mostly neighboring Tetuan, since the eighteenth century. We can find Tangier natives and their descendants in the United Kingdom, the Canary Islands, Portugal, Brazil, Venezuela, Argentina, France, Spain, Canada, the United States, and in many more places, including prestate Palestine and of course, contemporary Israel. The diversity of migration destinations and the early, ongoing process of migration underpin the power of human agency and dynamic social networks that helped shape aliyah from Tangier after 1948. After Israeli statehood, and even when Zionist emissaries were encouraging immigration to Israel, other destinations continued to attract Jewish inhabitants from Tangier and its surrounding cities in large numbers—as a result of long-standing, new, and resuming ethnic, kinship, and professional networks. 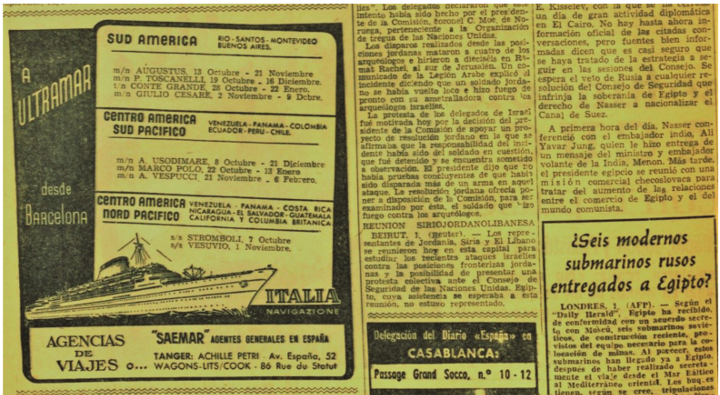 Reports on the Arab-Israeli conflict, alongside an advertisement for a ship sailing to the Americas, Tangier. Reprinted from España, October 2, 1956, p.2. The effort by the Zionist leadership to encourage and recruit immigrants to Israel in the mid-twentieth century provided a relatively new alternative for migration for the Jews of Morocco. It was a route full of obstacles, controlled by a robust state agency that included a "selective aliyah" policy, notably between 1951 and 1954, by which families were separated according to age criteria, professional training, and their health; between 1956 (October 1957 in Tangier) and 1961 aliyah became strictly clandestine due to its ban by Moroccan authorities. Political incidents, both in Israel and in Morocco, including the volatile situation in Israel, caused a stir among those Jews in Morocco who had contemplated aliyah. Peer groups of younger immigrants shaped by Israel's restrictions became the pioneers of aliyah in its earlier years. Only in Israel [did] I become interested in our traditions, while meeting people.… In Tangier [on the other hand], I used to feel much more French [referring to her connections with the large European community of Tangier in the 1950s]. The [Jewish] community was something I would come across only on special occasions. Clarice's and Alegría's personal stories point toward the need for an alternative analytical approach of Jewish migration from Muslim lands, grounded in the assumption that migration preferences and identities are dynamic, embedded within evolving social contexts. From this perspective, through the case of Tangier, it becomes clear that various groups of immigrants from Muslim lands were far less passive in shaping their aliyah histories than is conventionally believed. My approach challenges a historiography that disaggregates aliyah history from other Jewish and non-Jewish migration histories. It also questions studies that focus on policy making as the sole mode of analyses of the mass Jewish exodus from Muslim countries and demonstrates that each Jewish community was diverse and cannot be treated as a single regional unit of analysis, especially when local factors of migration are taken into account. 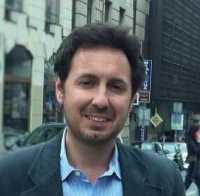 Aviad Moreno is a Kreitman Fellow at the Center for Israel Studies at Ben-Gurion University. He spent 2016–2017 as a Frankel Fellow at the Frankel Institute for Advanced Judaic Studies at the University of Michigan. Moreno's dissertation, "Ethnicity in Motion: Social Networks in the Emigration of Jews from Northern Morocco to Venezuela and Israel, 1860–2010," earned the 2016 Ben Halpern Prize for Best Dissertation in Israel Studies by the Association for Israel Studies. His book Europe from Morocco: The Minutes of the Leadership of Tangier's Jewish Community, 1860–1864 (Hebrew) was published in 2015 by the Ben Zvi Institute.